Melksham skittlers have continued their brilliant season by bringing yet another intercounty trophy home. This time it was the Melksham Allsorts C team who claimed victory over no less than 32 teams at a major weekend tournament held in Torquay. The specially-formed team, who play out of various clubs in Melksham, emerged triumphant, scoring 421 points in the finals and beating their nearest opponents by just three pins. 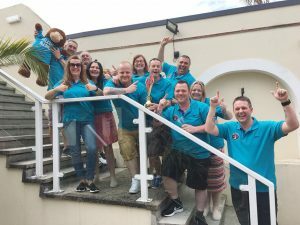 Forty team members and supporters from Melksham made the trip to South Devon for the competition, part of the Serious About Weekends Series 2018. The three teams, Allsorts A B and C found their form early and all qualified comfortably for the finals, a feat almost unheard of in the 25-year history of these competitions. The three teams found themselves pitched against a strong opposition from Wales, Devon, Gloucestershire, Worcestershire, Somerset, Bristol and Avon. Captain of Allsorts C, Richard George, said it was relatively easy getting through to the finals but from then on, the heat was on. It was close, with just seven pins separating the first four teams in a nail-biting finish. Allsorts C team claimed the trophy with 421 points, just three ahead of nearest rivals the Moffs Muppets on 418. Allsorts A finished in fourth place with 414 and Allsorts B came eighth with 354 points. This is the second victory in this year’s competition series to be won by a Melksham team. Melksham Sports won a previous tournament in Torquay in March. Meanwhile, The Good, The Bad and The Ugly teams A and B did well in Mill Rhythe on Hayling Island, where they finished third and fifth, in a field of 40 teams. Serious About Events also stage the British Skittles Championships which are currently in the group rounds and play off stages. Pictured: Left to right: Mascot “Monkey”, Mark Hughes, Lisa Hughes, Chris Cooke, Kim Adams, Team Captain Paul “Buzz” Barnett, Andrea Smart, Andy “Webby” Webb, Kevin Whatley, Kevin “Wee Man” Bainton, Sandra Webb and Andy “Billy” Bainton.